The Tides of Life is about the choices we make in life. Choices that require navigating those changing tides and winds of life as we pursue the right choice and avoid those that will result in harm or failure. For the leader there is often only one choice to make, to lead or mislead. Is there room for God in navigating these choices of life? 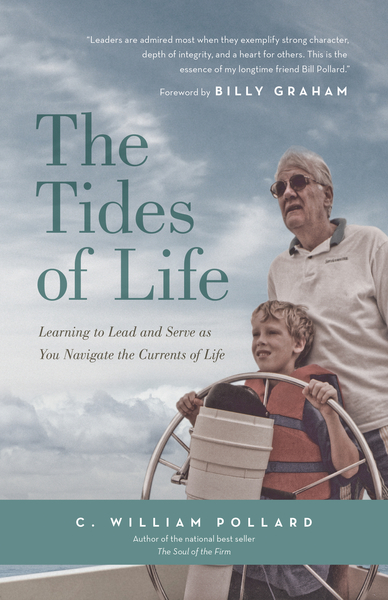 In writing this book, Bill Pollard responds to this question as he reflects on the lessons and choices of his life and suggests a framework of life for the choices we should make. His journey has involved an active and changing professional life of practicing law, serving as a professor and senior administrator in higher education, and leading a fast growing service company that, during his tenure as CEO, was recognized as the number one service company among the Fortune 500, and was acknowledged as one of the most respected companies in the world by the Financial Times. Bill has lived a life of learning from his faithful wife and family, from those he has worked with and served, and from teachers and friends including Peter Drucker, Billy Graham and Warren Buffet.